Picture - Junkers J 9 modern reproduction, in Luftwaffenmuseum Berlin Gatow. 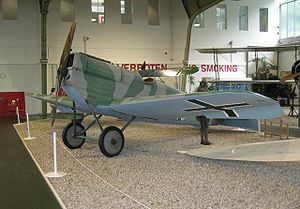 The Junkers D.I (factory designation J 9) was a fighter aircraft produced in Germany late in World War I, significant for becoming the first all-metal fighter to enter service. The prototype, a private venture by Junkers designated the J 7, first flew on 17 September 1917. Demonstrated to the Idflieg early the following year, it proved impressive enough to result in an order for three additional aircraft for trials. However, the changes made by Junkers were significant enough for the firm to redesignate the next example the J 9, which was supplied to the Idflieg instead of the three J 7s ordered. During tests, the J 9 was felt to lack the maneuverability necessary for a front-line fighter, but was judged fit for a naval fighter, and a batch of 12 was ordered. These were to have been supplied to a naval unit by September 1918, but instead equipped the same unit redeployed to the Eastern Front after the Armistice. One survives in a French Museum. Grosz, Peter; Terry, Gerard (1984). "The Way to the World's First All-Metal Fighter". Air Enthusiast 25 (August - November 1984): Pages 60-76. ISSN 0143-5450. Holmes, Tony (2005). Jane's Vintage Aircraft Recognition Guide. London: Harper Collins. ISBN0 0071 9292 4. World Aircraft Information Files. London: Bright Star Publishing. pp.File 898 Sheet 1.